TRIVIA of Noh : Q29 :Is Takigi-noh performed even if it rains? | Home | Trivia | Q29 : Is Takigi-noh performed even if it rains? Is Takigi-noh performed even if it rains? In recent years, there has been an increase in the number of occasions for performing Noh. Among them, the opportunity to stage tagiki-noh, which has a unique spatial atmosphere with its bonfires, has increased due to its popularity and mass appeal. 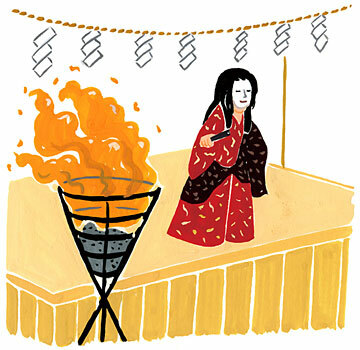 However, since it is mainly staged in the warm summer evenings, tagiki-noh tends to fall under weather constraints. During the wet weather, large-scaled takigi-noh performances might be cancelled or postponed, and indoor stages are reserved as alternate venues for small or medium-scaled performances. At times it can become indoor rōsoku-noh, Noh performed by candlelight. Such opportunities provided by rainy weather add another perspective to the performance of Noh. For the weather to suddenly change during an actual performance is definitely something that performers are eager to avoid. However, if such a situation develops, they deal with it in the best way possible. They may skip some parts of the jiutai (chorus by group reciters), which will not seriously affect the story, to shorten the play, or they may take a break and wait for the weather to clear. They just hope that some other alternative is not called for.